In search of providing better lives for their families back home, Myanmar migrant workers can be seen all over the world. This life can be hard and lonely. 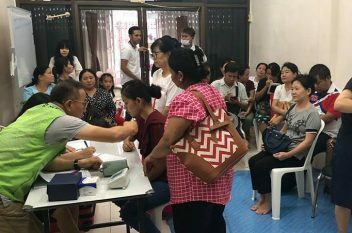 The Myanmar workers expressed the frustrations of working overseas. “We are like a shadow,” one confessed. Because many are supporting their families, they don’t have enough funds to even go to the doctor. This inspired the medical team to return to provide medical care for the Myanmar people. 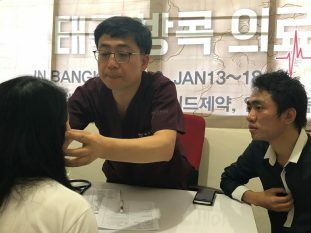 However, instead of a trip to Myanmar, Pastor Seo brought medical doctor Beak InGi, Korea District’s NMI president, Kim KyongNam, and multiple church members of Gu-sung Church of the Nazarene to the Myanmar people working in Thailand. When these workers left their jobs at 10 in the evening, that was when the medical team went into action. The team provided check-ups, medicine, treatment, and even ultrasounds. The Myanmar diaspora all over the world has created the need for prayer for these people away from their homes. Several churches of the Nazarene have also risen to this need. There are churches in Thailand, Malaysia, New Zealand, and the United States dedicated to fulfilling the needs of the people of Myanmar.